More than two main vitamins in sweet potatoes. Vitamin A and vitamin C are the two main vitamins in sweet potatoes. However, sweet potatoes contain a rich assortment of other vitamins and minerals as well. Did you know that sweet potatoes are a rich source of vitamins and minerals? Among some of the vitamins contained within sweet potatoes other that vitamin A and vitamin C, you'll find iron, copper, manganese, vitamin E, vitamin B6. Sweet potatoes also contain beta carotene which the body can convert into vitamin A. Can I Lose Weight Eating Sweet Potatoes? Vitamin A to help you to adjust your eyes to light changes, as well as keeping your skin healthier. Vitamin B6 to help you convert protein into energy while also improving brain function. Vitamin C to help boost your immune system, heal wounds, deters cell damage and also build healthy teeth and gums. Copper to help you maintain your cardiovascular and nervous systems. Vitamin E to help you maintain your circulatory system, improve your ability to heal and may help women decrease premenstrual syndrome. Iron to help transport oxygen in your blood. Manganese to help you break down Vitamin B1 and Vitamin E. It also helps you to break down excess amino acids and produce energy by breaking down fat and cholesterol. 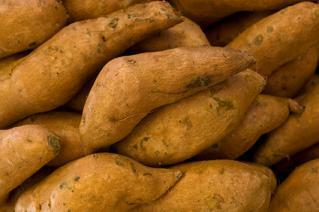 If you are not getting enough fiber in your diet, sweet potatoes will fill the bill, too. They provide a positive staple for your diet rich in nutrients with antioxidant properties. The interesting part of the nutrients in sweet potatoes is that they contain anti-inflammatory properties that help with arthritis, asthma and allergies. Drugs.com lists that some clinical studies on the efficacy of using sweet potato extracts as anti-inflammatories showed moderate success. The recommended dosage of the extract nutraceutical caiapo is two capsules 30 minutes prior to eating (up to six capsules per day). Reaction studies showed currently that people who were sensitive to sweet potatoes felt ill effects. You should consult a physician if you are concerned about allergic reactions. Sweet potatoes are among one of the healthier food choices you can make. Vitamins A and C contribute to healthy eyesight, hair and skin. If you smoke cigarettes, you are leeching vitamin A from your system. If you live with a smoker, their bad habit may be doing the same thing to you. Adding sweet potatoes to your diet can improve your overall health. Eating one sweet potato provides you with half the recommended daily need for vitamin C. Vitamin C and beta carotene are anti-oxidants that help you get rid of free radicals in your system. Sweet potatoes also contain vitamin E, another anti-oxidant. Anti-oxidants can help you reduce your chances of heart disease and cancer, and build up your immune system. Because sweet potatoes are also a great source of fiber, you can get more fiber than you would in oatmeal, half your daily vitamin C, more beta-carotene than in 23 helpings of broccoli and only 120 calories per serving. This makes it an ideal food to incorporate into your diet particularly if you are hypoglycemic or trying to lose weight. If you suffer from osteoarthritis, asthma or rheumatoid arthritis, adding sweet potatoes to your diet can help reduce inflammation because they contain manganese, potassium, copper and iron. All of these nutrients help in reducing inflammation. Sweet potatoes are an excellent food for diabetes control because they contain no processed sugars, are rich in vitamins, minerals and fibers and can help diabetics control their glucose levels. Sweet potatoes, a veritable cornucopia of vitamins and minerals, also contain vitamin B6. Vitamin B6 helps transform excess levels of the amino acid homocysteine. If you build too high a level of homocysteine, you increase your risks for strokes and heart attacks. Sweet potatoes are great choice for everyone in all walks of life. They provide you with a nutrient source that is healthy and packed with fiber. If you're looking to make a lifestyle change and to improve your health, consider adding sweet potatoes to the menu.